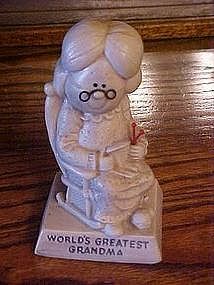 Berries Sillisculpts figure,"World's Greatest Grandma"
Berries had the greatest sentiment figures. This one is for the worlds greatest grandma. Granny sits in her rocker and knits. Figure dated 1970 and measures 6" tall. Great condition. Green felt on the bottom.